As one of our merry ladies turned 40 last week (it’s all fine, 40 is the new 21) we decided to invite a few extra friends and celebrate over a good meal. 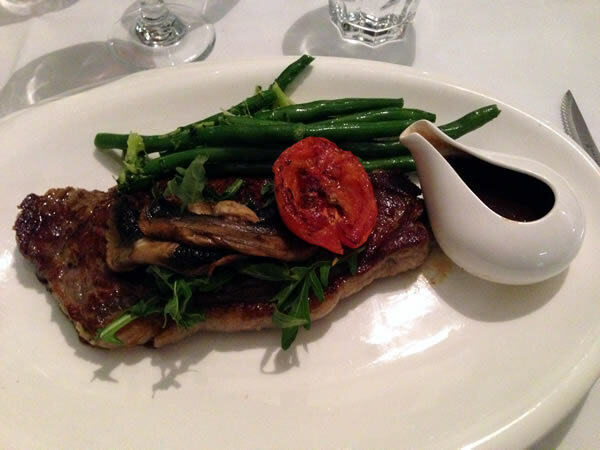 We had heard good things about Olive in Mawson so booked a table for 8. The first thing to note here is the welcome. On one of the coldest Friday nights Canberra has seen all Winter, the door was opened with chivalry and a smile, while a waitress (not dealing with us) said a warm hello as she walked by. We were shown to our table, which was up the back of the restaurant next to the bar. This was a nice set up for a special occasion, we were on our own while still being part of the restaurant, and where the woman who could only be described as the restaurant’s ‘mumma’ kept an eye on us. The restaurant itself is warm and inviting. Thick dark carpets and crisp white table linen were complemented by gorgeous intricate light fittings which cast a filtered light across all. The chairs were covered in black synthetic covers (which I can’t help but compare to shiny black condoms – sorry) and there was a smattering of flowers around. We sat and settled in with some bubbles (the restaurant is BYO although it does have a wine list) and as usual, good conversation took over. We were enjoying ourselves and happy to be catching up so didn’t notice the time going, but on reflection it did take a while for our orders to be taken (around 45 minutes), although it didn’t seem to matter. 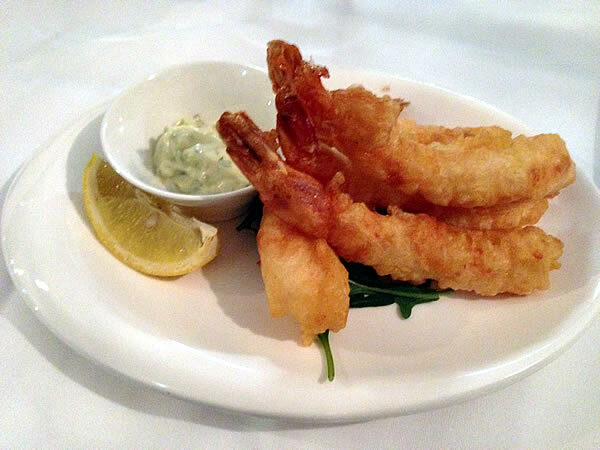 We had a range of starters between us including soft shell crab and eggplant parcels (both from the specials menu), suppli (rice croquettes) and tempura prawns. All were tasty and enjoyable (plates were emptied) although the seafood shone with tender sweet crab and prawns served up. Although the suppli and eggplant were both good, they weren’t as flavoursome as we would have expected. We moved on to mains with all hitting the right notes. 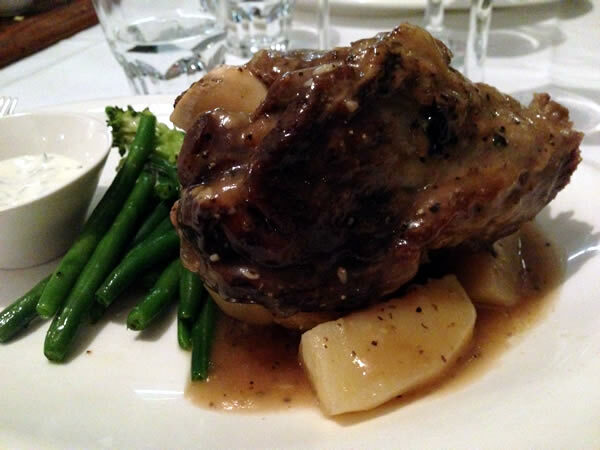 Slow cooked shoulder of lamb was a delicious mix of flavours. The meat fell off the bone when touched with the fork and when combined with the yogurt dressing and lemon potatos was delicious. The Angus sirloin melted in the mouth; a generous serve of perfectly cooked steak – medium as requested – with tarragon sauce and a generous side of piping hot shoestring fries. 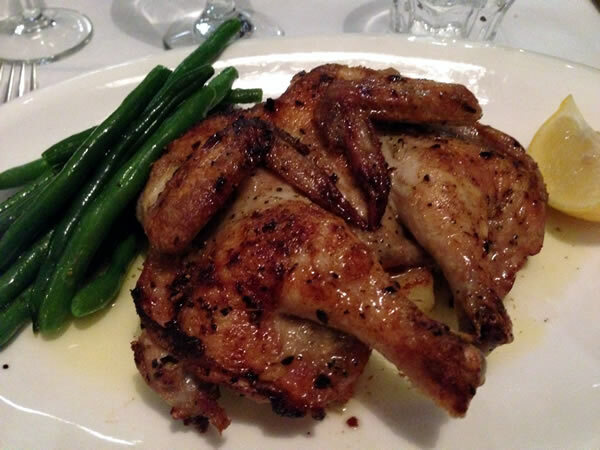 The spatchcock was butterflied and cooked to perfection, drawing some envious stares from other diners. 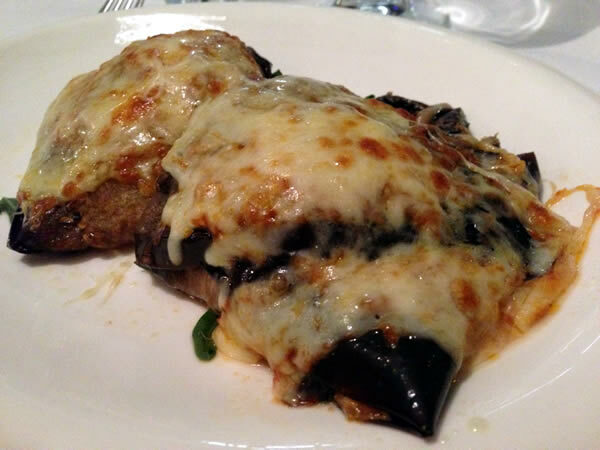 We also sampled a stuffed chicken breasts (with spinach, cheese and sun dried tomatoes) from the specials menu and they were tasty. The chicken was cooked perfectly which is often a bit of a feat when the breasts are mixed with other ingredients. The hard tasting yards came with dessert. The first big challenge of the night was faced when we were forced to make a decision. 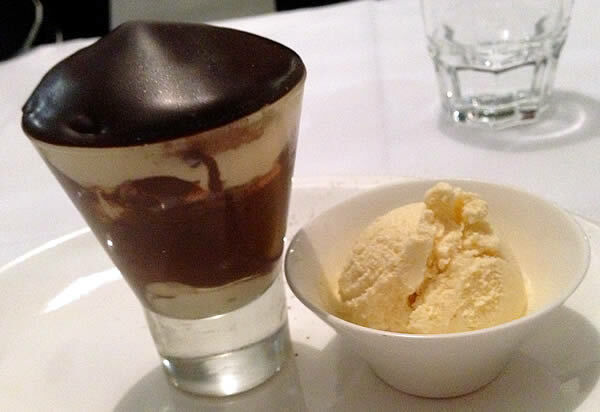 The trio of homemade ice creams (cleverly named ‘the olives’) was creamy and rich. 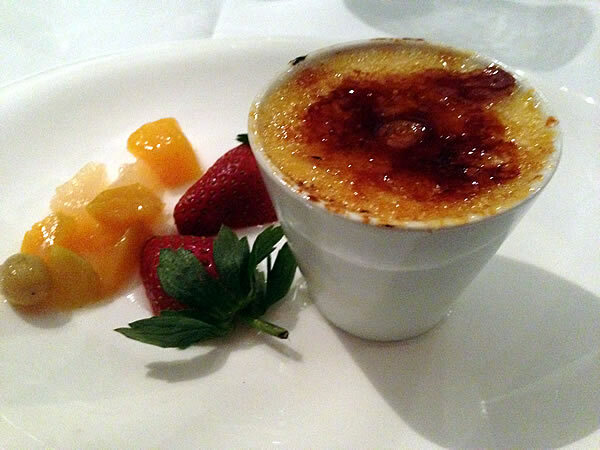 The creme brulee was thick and custardy with a suitably crunchy top. 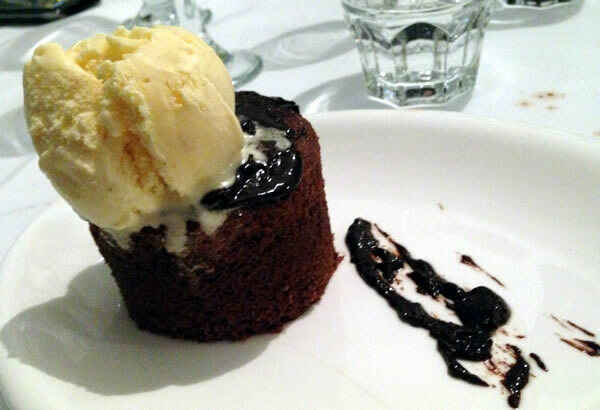 The chocolate torte, though light on the advertised fruit and nuts, was scrumptious and presented atop the obligatory skid-mark of chocolate sauce so often gracing dessert plates across the Capital. The tiramisu was perhaps the star of the show, with a thick layer of ganache on the top harbouring a lovely boozy cake beneath. Served with rich vanilla ice cream, it caused some level of tension between two of our ladies who had (rather stupidly) agreed to share dessert. Although there was no discussion of the fact, I suspect many top buttons were at this point popped. The food was good, but what stood out took a while for us to put our fingers on. The restaurant isn’t cheap ($15-20 entrees and $30 mains) but nor is it pretentious and in a city where funky new restaurants seem to be popping up in various precincts (when did we stop calling it an area or God forbid suburb?) it was refreshing to be in a place where it’s about the food and there’s a ‘mumma’ checking in on you from time to time. The Olive’s staff are a real asset to the place – we can’t remember the last time the ladies enjoyed such warm hospitality in Canberra. We can see how this would become a favourite for anniversaries, birthdays and special occasions. A bit of a treat, without having to push your way through the basketted push bikes and bearded hipsters to get in. Tags mawson Olive Where's the Ladies?